Classical wall panels in advertising are a great backdrop for whatever products are being marketed. Like this Lancome ad which shows our Louis XIV wall panels. Another view of the set design which was created by Jet Sets. The Louis XIV Wall Panels come in several different configurations and are sold as kits. They come in 14 finishes. Louis XIV Double Headpiece Wall Panel Set $299. The Center Headpiece can be positioned up or down. Shown here in our Antique Gold Finish. This kit comes with 2 headpieces, 4 corners and 16′ of moulding. They are easy to install. There is no mitering necessary. The moulding fits in a notch in the corner. Another image of the dress worn by Julia Roberts in the ad. This backdrop was created by Set Goddess. Another backdrop by Set Goddess using our Classical Wall Panel Set $199. Classical Wall Panel Set comes with 4 corners and 16′ of moulding. Some more images of fashions and furnishings shown with wall panel backdrops. Our Classical style panels are even prettier than these. We have a lovely Swag Headpiece $68, which can be used with our Classical and French Renaissance Wall Panels. 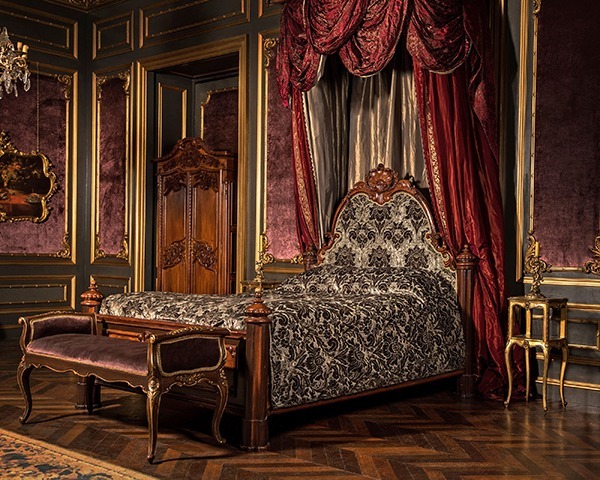 One of my favorite set designs using our Louis XIV Wall panelsl was the Paris Set for last seasons Outlander.